Five sections of the Lycian way. The Lycian way is the first long distance, marked trail in Turkey, between the cities of Fethiye and Antalya, in the south west of the country. 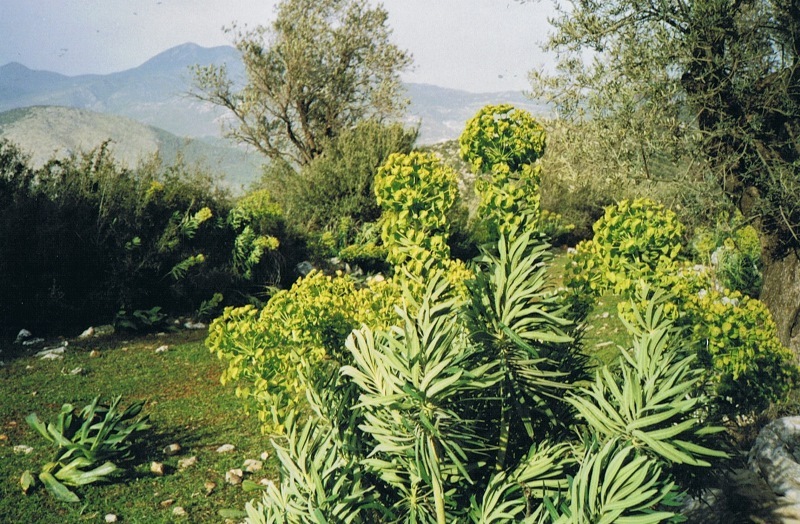 Lycia is the historical name of the present Tekke peninsula. The total length of the trail is about 510 kilometers and follows frequently the coast. The route we walked is going up and down all the time, often hard and stony underfoot. The Lycian way offers an unique combination of Mediterranean views, mountainous hinterland, Turkish culture and ancient ruins. Getting there: with a Turkish airline from Amsterdam to Antalya you arrive there in about 4 hours. You also can fly to Dalaman. For organizing this route we got a lot of help from Middle Earth Travel. They arranged - for instance - the transport from Antalya airport tot our start at Kalkan, 230 kilometers west of Antalya, as well the transport on the end of day 2. Including the accommodation on the route. Accommodation: we slept and eat at pensions, hotels and private houses. You can camp on the route also. Ask for permission. Maps: Kate Clow a.o. wrote a book about the route. Kate a.o. researched, designed and implemented the trail. The book describes the route in details and offers background and historical information. It also contains a map, a kind of design, in fact not always effective to walk on. As far as we know you can not buy cartographic hiking maps. Do You? So, bring a compass! Perhaps the "Lykischer Weg, Conrad Stein Verlag, 9783866864757, wandelgids-guide book" is another option. 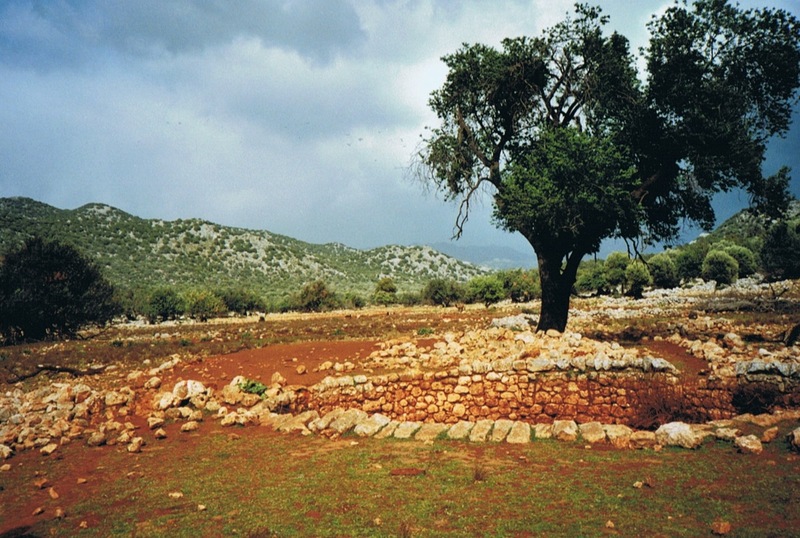 March 2008: five sections of the Lycian way. 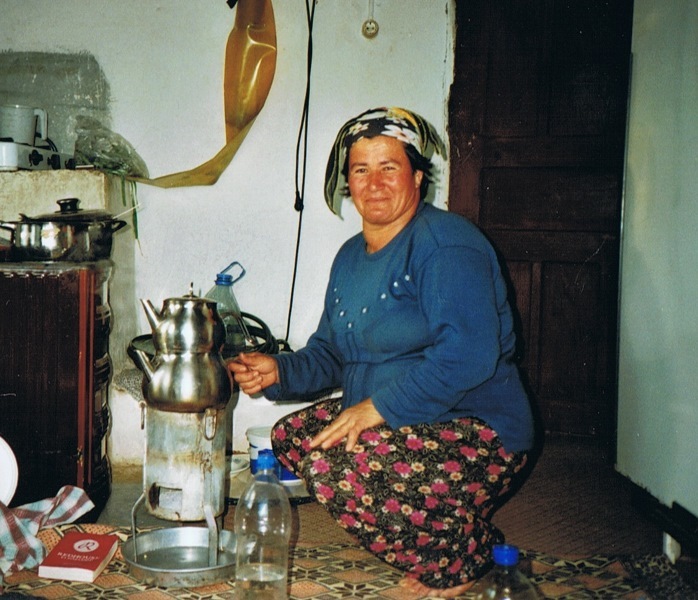 The route follows Greek and Roman roads, aqueducts, traditional nomad roads, goats paths, forest paths, local paths connecting villages. The route has a great relation with all those remains from the earlier inhabitants and visitors: the Lycian people, the Romans, crusaders and Arabs. 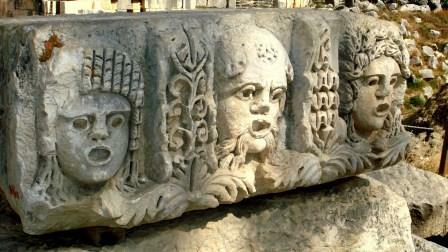 The route follows the aqueduct from Delikkemer to Patara. 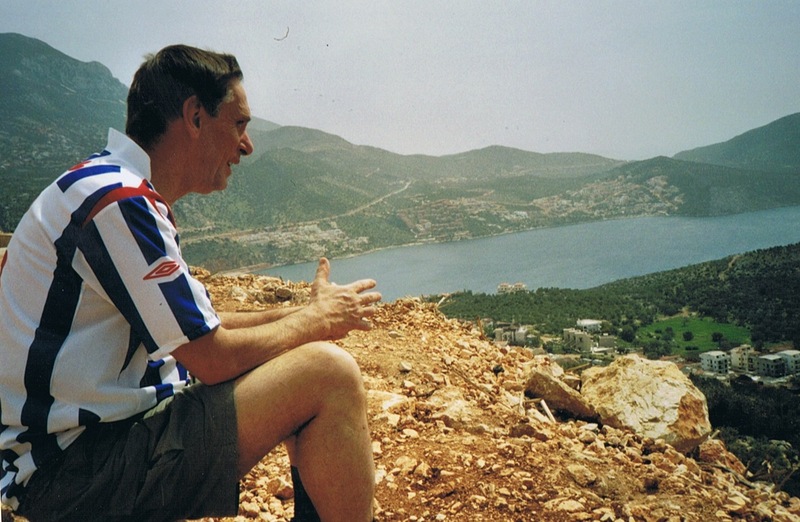 In 2008 a new road near Kalkan was made, so we lost the route for a while. The southern route and through Delikkemer to Akbel. Transport to Kaş. Next morning transport to Kiliçh. Next day transport to Antalya airport. On trail: this trail is one of the best we ever did! 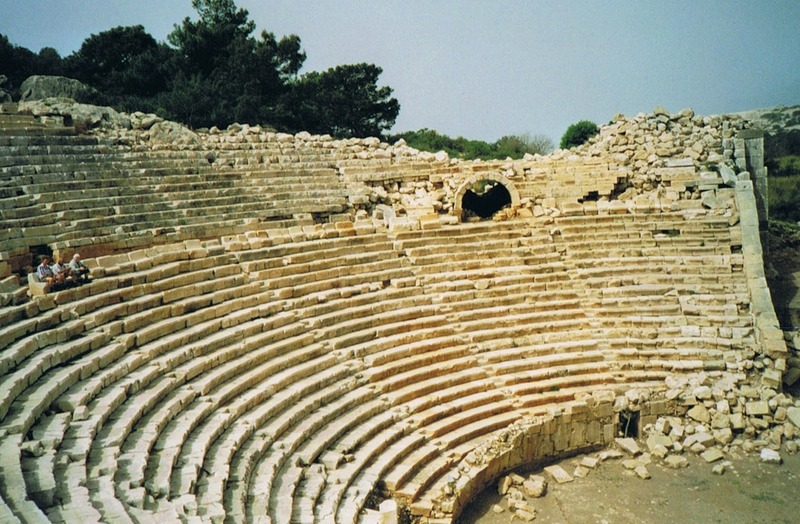 Patara with its Roman theatre. The aqueduct near Delikkemer, 2000 Years old sealed, siphonic pipe made of stone blocks is an engineering miracle built by Romans in Lycian style. Well preserved Lycian sarcophags, monumental tombs, great panoramas at the Mediterranean, the castles and fortress, the herds, the goats, the olive plantations, sunk cities, splendid and isolated beaches. Myra with the church of Nicolas, the Roman theatre, the remains of the Lycians ( a Greek-speaking people with a high civilisation)…….and all that in a fantastic landscape and - in spring - tolerable temperatures. The Patara beach is also a nesting spot for Caratta Caratta sea turtles. On trail you'll meet a lot of little turtles. And: nice and hospitable people on the route. We recommend walking in spring or autumn. In summer it can be too hot. 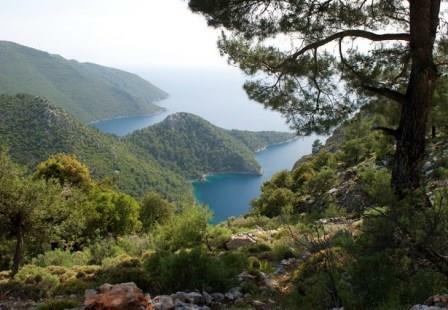 In terms of the variety that Lycian Way offers, it is listed in the world’s ten best walks. We are looking for a non-selfie video ( a video about the nature and culture, not about the video maker(s). On YouTube. Click here for part two of this fantastic trail.